I was expecting more of the same this time around. Pools 7, 8 and 9 are known for numbers of fish — both smallmouth and largemouth — and there are a variety of ways to catch them. My only real concern was rising water and finding a place to myself. Unfortunately, as the week unfolded, both became a problem. The Upper Mississippi is not only a productive fishery, it picturesque. On day 1, I put in at Lake Onalaska on the lower end of Pool 7. The first thing I noticed were large fields of matted grass, most of which were covered in duckweed. I couldn’t resist. For hours, I threw a frog and flipped Yamamoto craws to the edges of the greenery, expecting to find the mother lode. It never happened. Only in one small spot was I able to generate multiple bites, and they were just keeper fish in the 2-pound range. From there I moved to the main river to work some current breaks. On several wing dams and rocky banks, I caught numerous smallmouth. But they, too, were smallish in size. Since I was unable to find any quality fish there, I decided to spend the final two days of practice in Pool 8. Current breaks held numbers of fish along the main river channel. Starting the next morning in the Black River, I probed the shoreline, skipping docks and pitching to flooded trees. On several banks I got bit, but the traffic was too much … other Elite pros had the same idea. Seeing the added pressure, I moved out to the main river to look for schools of smallmouth and, in three areas, I found plenty of them. They were aggressive too. The only problem was that you had to catch more than a dozen to get a decent size keeper. On the final day of practice, I committed to the lower end of the pool. I accessed the Stoddard area because it’s known for matted cover and big fish. But after hours of trying, all I caught were more 2-pound largemouth. My next move was to the main river to ply some wing dams. On two, I found washouts holding large numbers of bass — both species. I knew then that I had found my starting spots. The fish were aggressive too. I was able to coax them with topwaters, swim jigs and a number of soft-plastics. I felt I was ready. 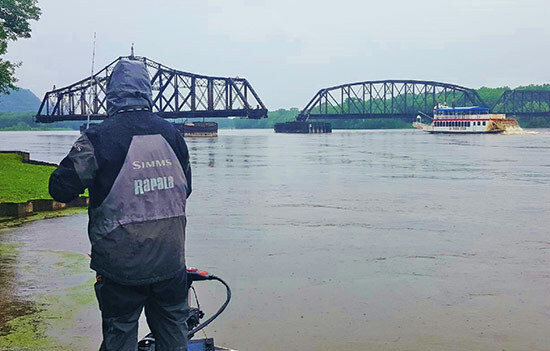 Having drawn boat number 14 I knew I’d likely be the first to reach the downriver washouts, and when my number was called, I raced directly to the better of the two. I could see that the river had risen considerably, but it was game on ... or so I thought. Cast after cast, I got bit … mostly by largemouth, but with a few brown fish mixed in. Although none were big I felt I was on track. By 8:30am I had a limit and was culling. At 10am, I had about 10 pounds. During that time, several other competitors tried to access my spot. I told my Marshal if we left, we’d probably never get in again. So I decided to stay and protect it … I believed more fish would find their way to it. Although I continued to catch bass throughout the day, I was never able to improve my catch. By weigh-in time I still had the same 10 pounds of bass. The cut was 14, which meant I would need 17 to 18 pounds on day 2 in order to catch up. The next morning I decided to try that same spot one more time, get a limit, then move to other areas as quickly as possible. When I arrived Wesley Strader was already there, Power-Poles down. So I moved to my other washout nearby. In minutes, I was putting fish in the boat. None big, but it was a start. Frogging matted grass with duckweed proved to be the best pattern. Moving from there, I tried other similar-looking places, adding only a fish or two in the process. None were the size I needed to catch up, so I decided to abandon the wing dams and move to matted vegetation. I felt there I might at least have a chance at bigger fish. It never happened. Although I caught a number of largemouth using a hollow-body frog, I never got the ones I needed. Again, I ended up with about 10 pounds of fish. Disappointed, I returned to weigh-in, only to learn that I had sunk further in the standings. My year was getting worse, not better. When will this nightmare end?